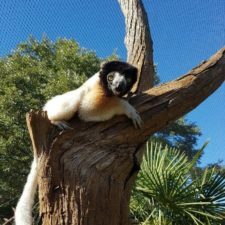 Every Tuesday on Facebook, Lemur Love holds “Ask a Researcher,” a question and answer forum for lemur fans from around the world to ask the experts any question they want. 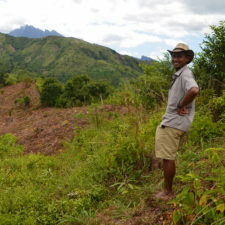 Questions can be about a particular lemur species, recent research, life in the field, and more. Below are some highlights from recent Lemur Love’s Ask a Researcher Tuesdays. Q: Are all lemurs social? A: To a certain extent. There are some species of dwarf and mouse lemurs that hibernate (one for up to 7 months and underground!) and spend much of their awake time alone. 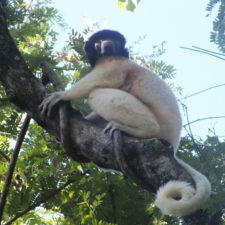 Others though live in small family groups, and of course the large lemurs are highly social. 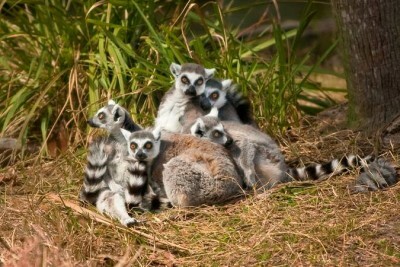 Ring-tailed lemurs. Copyright Jacksonville Zoo and Gardens. Q: Are all troops matriarchal? A: I’m not sure if by matriarchal you mean do females stay in the social group to which they are born, or are females dominant. Either way, dispersal patterns vary, but it’s more common in primate species for males to migrate. Dominance patterns vary throughout the lemurs from very strict female dominance (ring-tailed) to egalitarian systems (red-bellied and mongoose), but there are no male dominated species of lemur. Q: Is parenting shared with the male in the wild? Do other members of the troop assist in rearing? A: Do you mean do males assist in rearing young? If so, no. Males are generally fond of youngsters and can spend significant amounts of time playing with them, but they don’t share in parental care. Ring-tailed lemur females will allo-nurse and sometimes carry another’s infant. Ruffed lemurs have communal care and construct nests to stash babies of related moms. Mothers then take turns feeding away from the group and watching the young. Q: How do baby lemurs hang onto their moms’ backs? Do they hold onto their fur? They make it look effortless, but it seems like it wouldn’t be the easiest thing. Also, do parent lemurs ever hold the babies in their arms? A: Yes, they hang onto fur! All healthy newborn primates have the ability to cling very tightly to their moms. Cradling happens too, but lemurs don’t spend a lot of time doing this, as they are on the move! Did you know that many of the brown lemur babies ride around their mom’s waist, rather than on their front/back? Its pretty cute to see a baby lemur belt! 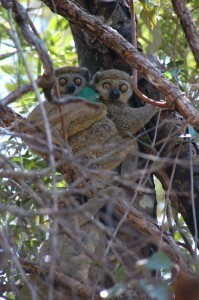 Q: Are there any examples of lemur inter-species friendships or symbiotic relationships? Q: I’m curious about the songs that the Indri sing during the mornings/day. I know each family member has its own part of the song that they sing, but do the meanings of the songs go deeper than that? For example, weather reporting, status of well-being, communication with other families, or even something more complex, etc. A: Interesting questions! 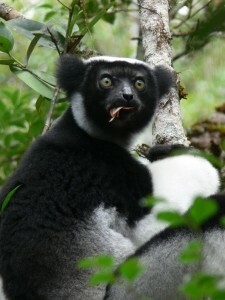 The indri song functions to strengthen bonds between family members and delineate territory between neighboring groups. Duetting bouts are energetically expensive and thus transmit information about well-being, in a way. As for direct messaging like weather or maybe predator reports, there is no evidence for this, but “we” don’t fully understand message content. Their songs are beautiful! 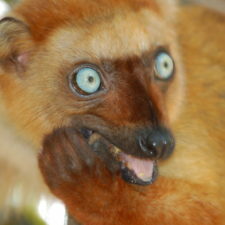 Q: How far back can lemurs be traced? » Learn more about their origins in this article, with video! Thanks Lemur Love! Tune into their Facebook page every Tuesday to ask your own questions. And, we’ll share some of the most interesting Q and A’s every couple of months on the blog!